The content of this post may be sensitive to some readers. I am 26-years-old and I don't know what a carrot tastes like. I could name many more things I've never tasted, but listing what I do eat is much easier than listing what I don't. I subsist mainly on a steady rotation of cereal, pizza (cheese or pepperoni only), french fries, plain chicken, grilled cheese, and a handful of snack foods. I'll eat pasta, if it's sauceless (think buttered noodles). I'll eat mac and cheese -- but only if my mom, nana, or sister makes it. I eat almost any kind of dessert (except for carrot cake because, even though I've been assured time and again that you can't taste the carrots, I know they're there). Basically, I eat the way Kevin McCallister does when left to his own devices. My whole life, I was called a picky eater, but I was always assured that I would grow out of it. My parents had both been "picky" (according to my grandparents), but like most children, they had grown out of it. By their early teens, they ate like normal, well-adjusted people. As a kid, I believed that eventually, that would happen for me too. By the time I graduated college, I had accepted the fact that I would never be a "normal" eater. I thought I was a one-of-a-kind freak. That was, until last year, when a friend sent me a link to a Wall Street Journal article that perfectly described my pickiness and gave it a name: Selective Eating Disorder, also known as Adult Picky Eating. Doctors once thought only kids were picky eaters, and that they would grow out of it. Now, however, a taskforce studying how to categorize eating disorders for the new version of the Diagnostic and Statistical Manual of Mental Disorders, due out in 2013, is considering recognizing for the first time a disorder to be called "selective eating" that could apply to adults as well as children. 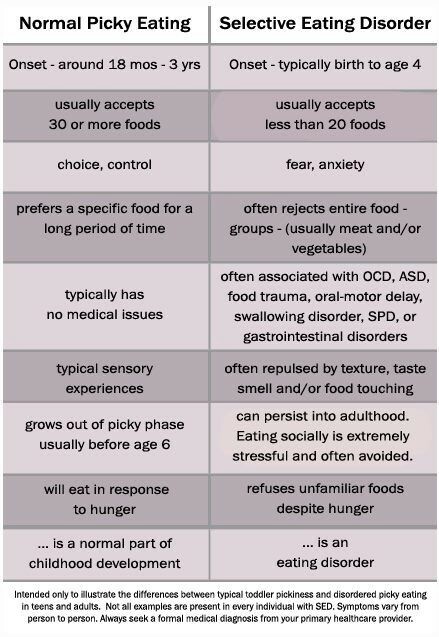 The DSM, a common psychiatric reference book, would currently lump picky eaters into a classification of eating disorder "not otherwise specified," a catchall category for people who don't meet the criteria for a major disorder. Learning that you have an eating disorder is a strange experience. It's tough, sometimes, to apply the label to myself since picky eating has nothing to do with body image (or at least, it never has in my case). Even though I had always known that my relationship with food was unhealthy, socially prohibitive, anxiety-inducing, and out of my control, the idea that it could constitute a legitimate eating disorder had never crossed my mind. It had also never crossed my mind that there were other people just like me. Perhaps I shouldn't have been so surprised. Several times in my life, I've been approached by concerned friends who suspected I was anorexic, even though I've never been close to underweight. I couldn't blame them though; eating in public is a great source of shame for me, so I've used every excuse in the book not to do it. Often, when I couldn't outright avoid a meal, I would try everything I could to create the appearance of eating without actually doing it. I became an expert at shifting food on my plate to make it look like it had at least been picked at. I hid food in napkins. I accidentally-on-purpose dropped things on the floor. Things most people don't associate with food have always been on my mental off-limits list. As a kid, I refused invitations to sleepovers because the thought of someone's mother trying to feed me dinner or breakfast made me cringe. I had a crippling fear that other adults would force feed me against my will. And even if they wouldn't, none of my friends knew the extent of my pickiness. I didn't want to be exposed. I never went to summer camp because movies like The Parent Trap and It Takes Two had convinced me that the only food served at camp was the Sloppy Joe, which was in no universe something I would eat. I was also convinced that summer camps were a breeding ground for food fights, and being in a food fight was one of my worst nightmares. The idea of foods I can't eat touching my body still makes me gag. Literally. As a child, my parents were very understanding of my eating habits. I used to eat more foods than I eat today, according to them -- but I was young enough at the time that I have no memory of it. They say when I was a toddler, I started eliminating foods from diet, announcing without provocation that I would no longer eat things that I had eaten happily before. Even though my parents were beyond patient with me, there was even a period of time when they tried to bribe me to eat new foods. I had begged my mom for this cheap, plastic dish set. It looked like crystal and I'm not sure why I wanted it (I wasn't much for playing house, really). My mom bought it, but told me that I could only have it if I tried one vegetable. I mustered all of my courage and agreed to try corn. I reasoned in my head that since I ate popcorn, it was the best option. I don't think I swallowed one bite. As soon as it touched my lips, I started dry heaving, gasping over and over almost to the point of vomiting for what felt like at least 20 minutes (but couldn't possibly have been that long; my mom would have taken me to the hospital). I wanted desperately to eat even just one bite of the corn, but the very attempt made me physically ill. I couldn't do it. By high school, I had a new problem to worry about: Dating. Dates involve meals, and I don't like eating meals with people I don't know very well. 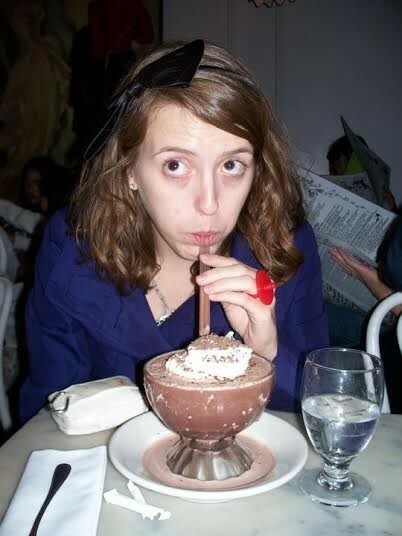 When I was invited to a junior prom, my date took me to dinner before the dance, as dates tend to do. I ordered a side of french fries. At first, he thought I was trying to be thrifty, since he was picking up the tab, and encouraged me to get whatever I wanted. But that was all I wanted. I didn't try chicken until I was 20, so it was literally the only thing on the menu I ate. "If you don't want to eat much, just get a salad," he urged. This was a common misconception about my eating in high school. Frequently, people misinterpreted my eating habits as a bizarre form of calorie counting. This always baffled me, since nothing I ate was remotely healthy. I told him I didn't like salad, which was a lie -- I didn't know if I liked it. I had never eaten it. Even though he eventually relented and let me awkwardly eat my plate of french fries in formal wear, my first date confirmed a lot of my fears about how food would affect my love life. I've dated plenty, and different people respond to my picky eating differently. My first serious boyfriend never seemed bothered by it in the least, but in other cases, it's been a big source of tension. It mortified one guy I dated. In college, I ate every meal alone for the first two years, and would be "so busy" anytime anyone invited me to an unfamiliar restaurant. As an adult, I dread networking events that involve food. Catered dinners and set menus are the bane of my existence. Only in recent years have I begun to tell people about my eating. Explaining it is a difficult and stressful ordeal, but I make a point to try to talk about it with my closer friends, since the alternative is avoiding social interaction or the even more difficult and stressful task of trying to hide it in public. For the most part, people are nice about it. Some laugh and think I'm joking at first -- and almost all have a few questions to ask about it. Everyone wants to help. It comes from such a good place that I couldn't possibly be upset by it, but it just illustrates how little people understand my situation. "Oh, you have to try [insert food of choice here]," friends say. "You will love it if you just try it!" Yeah, maybe. But it's not that simple. Sometimes it isn't a matter of taste; often it's texture or smell or just plain fear that stops me from trying a food. If it doesn't go well (which it usually doesn't), I risk embarrassing myself with a spastic session of dry heaving or actual vomiting. The biggest misconception about my eating disorder, however, is that it's my choice. I never get upset by people who want to help; who approach my disorder like it's simply never occurred to me to try Thai food. But I do get a little upset when I'm accused of actively choosing this lifestyle. There is nothing I would like more than to eat anything and everything. I would love to go to a restaurant without reading the menu online to make sure it serves something I'll eat. It would be amazing not to be the person that holds a whole group back when everyone wants Chinese food but settles for pizza so that I'll be included. It would be great to be able to accept an invitation to have dinner with a friend's family without panicking about the conversation that's guaranteed to take place when all I eat is bread. It would be incredible not to live in fear of routine blood work revealing horrible vitamin deficiencies or malnutrition. My eating disorder is easily the thing that I like least about myself. I've tried to change it. Friends and family have suggested everything from therapy to hypnosis to try to overcome the issue, but I've never sought professional help specifically for my eating disorder. While seeing a counselor briefly about anxiety, I mentioned the issue and earned some new insights (it's closely related to OCD), but no concrete advice on how to overcome it. At this point, I haven't heard of any effective treatments for selective eating disorder, but I am open to trying out specific treatments in the future. Twice in my life, I've gone through brief phases of recovery, during which I was able to try new foods. The first was when I was 20 and I added chicken to my diet, which literally changed my quality of life for the better more than any other single thing has. Last year, I tried a burger for the first and only time. Nothing was permanently added to my diet that time around. If the math holds up, I might try a carrot by the time I'm 30.